Peter Fingar, author of the internationally acclaimed book, Enterprise E-Commerce, joins forces with long time colleague Ronald Aronica to go beyond e-commerce and on to the solid business fundamentals of the digital economy. The Internet is a whole new infrastructure for an entirely new way of doing business and competing. Economic transactions become frictionless as they move from places to spaces. The crisp and insightful chapters make quick reads for CEOs, COOs, CTOs, CIOs, and line-of-business executives with little time for reading--distilling what management needs to be doing and thinking today to prepare themselves and their companies for the ride ahead. Now that doing business on the Internet is reaching the mainstream, it's no longer e-business or e-commerce--it's just business and commerce. Fingar and Aronica take the mystery out of the deep and profound changes being ushered in by the ability to connect anyone-to-anyone or any computer-to-any computer across the globe in real-time. The book signals the death of the e-hype and the beginning of the real work of building hyper-efficient, hyper-effective corporations that will continue to thrive in the years ahead. Rather than throwing out the established fundamentals of business (the rules of the so called "old economy"), the book builds on and extends the recognized work of the thought leaders that have shaped today’s business world: Michael Porter's value chain analysis, Hammer and Champy's business process reengineering, Hamel and Prahalad's industry reinvention, Rummler and Braches's management of the white space on the organization chart, Kaplan and Norton's balanced scorecard, Peter Drucker's management wisdom, Tom Davenport's business process innovation, and Edwards Deming's quality management. The book provides the "business ahas" GE's legendary CEO Jack Welch got after being introduced to the Internet by his wife, Jane. Welch launched his "Destroy your business.com before some upstart in a Silicon Valley garage does!" campaign in 1999 and challenged all of GE’s line-of-business executives to "Grow your business.com" by reinventing every aspect--buy, make and sell--of their business units. Welch "got it," realizing that the Internet is about business transformation, not a Web site. The book systematically disassembles an enterprise's business processes, core competencies, and value chains; then reassembles them into dynamic customer-driven value webs and business ecosystems. Along the way, the authors explain the emerging business models of electronic marketplaces, peer-to-peer commerce, e-hubs, B2B exchanges, auctions, wireless applications, m-commerce, B2B consortia, collaborative commerce, digital strategies, essential technologies and e-services. The Death of "e" is a book within a book. Part one provides a clear and insightful high-level view for busy executives, while part two presents the best of the industry thought leaders’ analyses of the key issues facing digital commerce: B2B integration, visibility across value chains, collaborative commerce, adaptive marketplaces and intelligent support. The 'Death of e' is unquestionably the birth of a new understanding of where the real new economy is headed. The authors show amazing technological and business acumen. Insightful, pragmatic, visionary, but grounded deeply in the realities of today. A delightful find and a must read for today's companies that want to thrive in the 21st century economy. This book will no doubt have as great an influence on management thinking in the decade ahead as Hammer and Champy's classic, Reengineering the Corporation, did in the last decade. The authors guide us into the sustainable business models of the new century and out to the edge of the network for a whole new way of conducting business. Decision-makers need to read this book. See, I told you the "New Economy" was all smoke and mirrors! 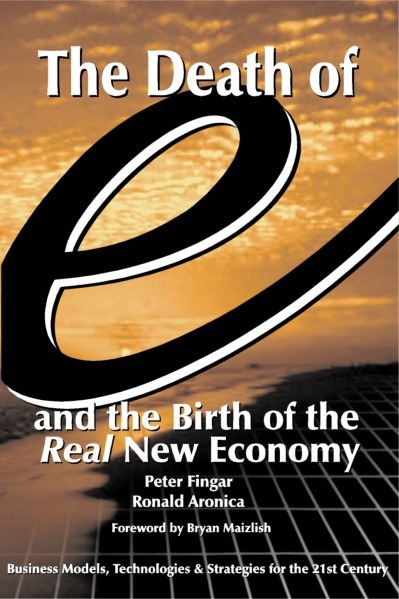 Of course, as this book explains, there is something very new in the real economy. The 'Death of e' is the first clear expression of how to leverage existing information assets and the Internet into real return on investment. The Internet itself is going through a period of great change in response to the demands of the digital economy. The 'Death of e' provides fascinating insight into what lies ahead ─when a breakthrough technology such as XML gives business leaders unprecedented market visibility, and greatly accelerates their ability to deploy and re-deploy the building blocks of business. Chief Technical Officer, Contivo, Inc. Truly a remarkable synthesis of current management thinking and e-business trends. A required read for anybody involved in supply chain management as it provides a logical, compelling, and operational road map of how efficiency, responsiveness, and reliability of supply chains can be improved. Co-author, "Supply Chain Glitches Torpedo Shareholder Value"
Myth 1. There is a new economy. Myth 2. The Internet is a business fad that faded in 2000. Myth 3. The foremost goal of a company is to deliver shareholder value. Myth 4. Clever ideas make new wealth. Myth 5. B2B marketplaces should be the focus of e-business efforts. Myth 6. B2C e-commerce is dead. Myth 7. The need for speed is central to competitive advantage in the Internet Age. Myth 8. The Internet disintermediates. Myth 9. Built it and they will come. Myth 10. E-commerce is dead. Is There a Future for Peer Computing? Bryan Maizlish is the Director of Marketing-Business Development for Lockheed Martin Global Telecommunications, and is responsible for identifying market trends, partnerships, acquisition and new business opportunities. Maizlish served as EVP, Chief Strategy Officer, and CFO for Noor Group Ltd. who is building an Arabic portal, data center, and access network infrastructure in Egypt. He served a similar role for Magnet Interactive, whose clients included: Nissan, Infiniti, Mayo Clinic, Federal Express, FirstUSA, Kellogg's, Discovery Communications, Crayola, and DuPont.. Maizlish earned his MBA at Wharton. Bob Anderson is the Business Evangelist for Groove Networks, MA-based company developing peer-to-peer and peer-to-Web software solutions that provide businesses secure, online working relationships with key suppliers, partners and customers. His primary focus has been on articulating the Groove peer-to-peer value proposition in the business context, particularly with regard to trading partner collaboration: Collaborative Planning, Forecasting and Replenishment, Supply-Demand Chain, New Product Design and Net-Markets. Scott Blackburn is President and CEO CommerceQuest, the company he co-founded in 1992. He fostered the company's rapid growth to become a leading provider of complex business integration software and services. Under his direction, the company has delivered technology solutions to Anheuser Busch, American Express, Ericsson, EDS, ICG Commerce, Tech-Data, AAA, Publix Supermarkets, Wal-Mart, Ahold, GTE and State Farm. Blackburn holds the BS/CS degree from the University of Kansas. Anthony Dutton is Director of Corporate Communications for XML Global Technologies. As well as having a Bachelor's Degree in Architecture, Anthony also holds a joint MBA from The Cranfield School of Management in the U.K and the Ecole Supérieure de Commerce in Lyons, France. Tim Harmon is the vice president of marketing and product strategy at Exterprise. Prior to joining Exterprise, Harmon served as vice president of Retail & Distribution Strategies at META Group, a leading IT research and advisory services firm. Harmon earned a B.S. degree in computer science, business administration and math at Iowa State University. Barry Morris is CEO for IONA Technologies. Before being named CEO, he was COO with responsibility for day-to-day operations. He created IONA's iPortal strategy and oversaw the expansion of the company's US offices. Previously, Morris was a consultant at Digital Equipment Corporation. Morris earned his BA from New College, Oxford University. Dr. SP Rana is co-founder, vice-chairman and CTO of Exterprise. Prior to Exterprise, Rana led IBM Global Services' technology strategy development, global program implementations and vendor alliances for their strategic outsourcing business. He has 20+ years of IT experience and a unique combination of enterprise architecture experience that encompasses business process collaboration, distributed computing and customer service issues. Dr. Rana has a Ph.D. in computer sciences from Indian Institute of Technology (IIT), New Delhi, a master's degree in operations research and a bachelor of science in mathematics. Manoj Saxena is co-founder, president and CEO of Exterprise. Prior to founding Exterprise, Saxena served as business unit manager at 3M, where he had $100 million of P&L responsibility for the Telecom Systems Division. Saxena brings more than 15 years of experience in business development, product marketing, and strategic planning in the telecommunications, medical and manufacturing industries. Saxena has an MBA from Michigan State University and received an MMS degree from Birla Institute of Technology and Science, Pilani, India. Biri Singh, President and CEO, co-founded Idapta in February 1999 with the idea of building an enterprise software company to attack the significant opportunity within B2B e-commerce. Previously, Biri was COO of RelevantKnowledge Inc. and served as a consultant for Ernst & Young's communications, media and Internet commerce practice. Biri holds an MBA from the Kenan-Flagler School of Business, University of North Carolina. Justin Steinman serves as Solutions Marketing Manager for Tilion. Prior to Tilion, Steinman was a consultant with Accenture's Enterprise Business Solutions group where he led a team of consultants responsible for developing strategic and systems solutions through ERP installations for large, multi-national clients. Steinman is a Phi Beta Kappa graduate of Dartmouth College. Christopher Stone is the CEO, President, and Founder of Tilion, founded to address the unmet business requirement for an on-demand, unified view of the supply chain. Stone is a noted technology visionary, with more than twenty years of experience leading high technology industry innovation. He was executive VP of corporate strategy and development at Novell, playing a key role in its turnaround and resurgence. Previously, he founded the Object Management Group (OMG), the largest software development standardization group of its kind. David R. R. Webber is VP of Business Development with XML Global Technologies. David has over twenty years experience designing and implementing business systems for a broad spectrum of industries; and is a US patent-holder for advanced EDI software technologies. David is a co-founder of the XML-EDI Group and an acknowledged international authority on XML, EDI, metadata-registries and Web-based software engineering. He is currently involved in an advisory role with a wide variety of industry initiatives including ebXML.